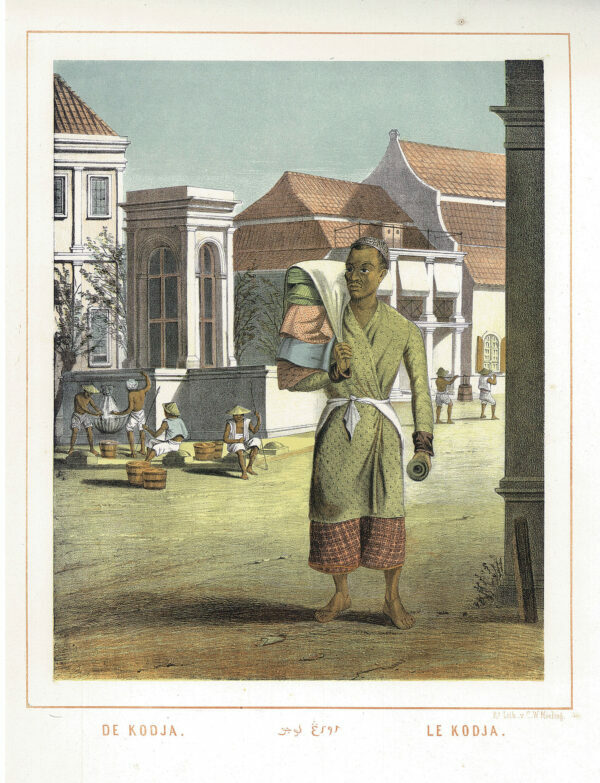 Antique Print of a Man selling cloth titled ‘De Kodja / Le Kodja’. A rare and much sought after coloured lithograph print by Auguste van Pers (1815-71), from original drawings by the French artist, Ernest Hardouin and published by C.W.Mieling, The Hague, who published the work between 1853 and 1862 in Nederlandsch Oost-Indische Typen. Auguste van Pers arrived in Indonesia early in 1837 and shortly afterwards was employed as an engraver and draughtsman in the Geographic Dept. of the Bureau of Statistics in the General Secretariat at Buitenzorg. In 1843 he moved to the recently established printing office of the Topographical Bureau of the Engineers, and there executed lithograph plates for Junghuhn’s article in the Tijdschrift voor Neerlands-Indie (1844). At the same time his talents as an engraver were enlisted by the booksellers, Ukena & Co., Batavia, to execute a series of lithograph plates after drawings by the French artist, Ernest Hardouin, for a work entitled Nederlandsch Oost-Indische Typen, which was to depict the various elements of Indonesian society, accompanied by brief, and, so far as possible, humorous descriptions. The work was announced as being in preparation by Ukena & Co. in the Indisch Magazijn in 1844, when some proof plates were printed but the work did not proceed and by 1851 Van Pers and Hardouin had decided to go their separate ways. In October 1851 Lange & Co., Batavia published Part 1 of Nederlandsch Oost-Indische Typen – drawn from life and lithographed by Van Pers, with descriptions in Dutch and French, and plate captions in those languages as well as in Javanese and Malay. – the work was to published in 12 parts, large quarto format, with 72 plates. The work was never completed due to Van Pers ill-health and his departure for the Netherlands in January 1852. A total of 16 plates apparently printed although it is possible that only the 6 contained in Part 1 were actually published. In the Netherlands the enterprise was taken over by C.W.Mieling, The Hague, who published the work between 1853 and 1862. Mieling stated that the work would appear in 20 parts, each of which would contain four large coloured plates, with text in Dutch and French. As originally projected, the complete work would contain 80 plates, a figure that was never reached. Brinkman’s Catalogus states that 40 plates were published although in fact 56 plates were published but most extant copies contain only 44 plates. The plates vary greatly in subject matter; De Schutter is easily the most successful and popular plate but the best three in terms of composition and quality of lithography are the Chinese Card Players, the Indonesian Kite Flyers and the African Soldier.